The fool does not understand the full implication of what he is saying!! 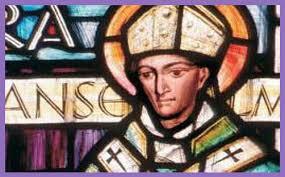 St. Anselm’s life and work: ¨He was born in 1033 and died in 1109. He was from Aosta, in Piedmont. As a member of the medieval Christian and of the European community which had begun to take shape, he did not restrict his life and activity to the country of his origin, but lived principally in France and England. He ultimately was named Archbishop of Canterbury, in 1093; he remained in that office until his death. St. Anselm’s entire life was devoted to study and religious activity and in his last years upholding the Church’s rights as a spiritual power, which were then being seriously threatened. St. Anselm is the second great medieval philosopher, Scotus Erigena being the first. Strictly speaking, he was the founder of Scholasticism, for it is only with him that this movement acquires its definite character. St. Anselm wrote several books. Many are of predominantly theological interest; there are numerous letters full of doctrinal substance. The most important philosophical works – all short pieces—are contained in the Monologium (A model for meditation on the reason of faith) and the Proslogium, which carries as a motto the phrase which summarizes the meaning of all his philosophy: Faith seeking understanding. St. Anselm’s faith and reason: St. Anselm’s theological—and philosophical—work is primarily concerned with proofs of the existence of God. This is the topic which receives most discussion in his writing and the one most closely associated with his name. however, these proofs cannot be properly understood unless one is aware of the whole range of St. Anselm’s thought. St. Anselm begins with faith; the proofs are not meant to lend support to faith, but are themselves supported by faith. His principle is: I believe in order to understand. In the proslogium, his major work, he writes: For I do not wish to understand in order to believe; rather, I believe in order to understand. However, this is not a question of something distinct from faith; faith itself desire to know, seeks intellection, and this desire for knowledge arises from the internal character of faith. The ontological argument: In his Monologium St. Anselm gives various proofs of the existence of God, but the most important proof is the one he expounds in the Proslogium, and which, since the time of Kant, has generally been referred to as the ontological argument. This proof of the existence of God has had enormous repercussions in the entire history of Philosophy. Even during St. Anselm’s lifetime a monk named Gaunilo attacked the proof, and St. Anselm himself replied to Guanilo’s objections. Later on, opinion was divided and interpretations of the argument differed. St. Bonaventure took a position close to that of St. Anselm; St. Thomas rejected the proof; Scotus accepted it with modifications; Descartes and Leibniz made use of it, with certain alterations; then Kant , in the Critique of Pure Reason established its impossibility in an apparently definitive way. Yet Hegel afterward restated the proof in different terms, and still later. In the nineteenth century, it was studied in depth by Brentano and Father Gratry. Up to the present day the ontological arguments is a central theme of philosophy, because it involves not only mere logical argumentation, but also a question that concerns all of metaphysics. This is the reason for the singular renown of St. Anselm’s proof. Introduction to the Proof: It will be sufficient here to indicate briefly its essential meaning. St. Anselm’s point of departure is God, a hidden God who does not manifest Himself to man in his fallen state. This is a religious point of Departure: the faith of man, who was made in order to see God but has not seen Him. This faith seeks to understand, to practice theology. But there does not appear the necessity or possibility of demonstrating the existence of God. St. Anselm cites the Thirteenth Psalm: “The fool hath said in his heart, There is no God”. This denial calls the existence of God into question for the first time and gives St. Anselm’s proof a meaning it lacks without the fool’s statement. When the fool says that there is non God, he understands what he is saying. If we say that God is that entity such that no greater entity can be imagined, the fool will understand this as well. Therefore, God in his understanding; what he denies is that God is also in re, that is, that He really exists. But if God exists only in the imagination we are able to imagine we are able to imagine that He could also exist in reality, and this conception of him is greater than the earlier one. Therefore, we are able to imagine Something greater than God if He does not exist. But this contradicts our premise that God is such that nothing greater than He can be imagined. Then God, who exists in the understanding, must also exist in reality. That is, if He exists only in the understanding, He does not Fulfil the necessary condition; therefore, it would not be God of whom we were speaking. As a matter of Fact, St. Anselm’s proof shows that the existence of God cannot be Denied. It consists of confronting the fool’s denial with the meaning of what he is saying. The fool does not understand the full implication of what he is saying, and for this very reason he is a fool. He is not thinking of God, and his denial is an error. His folly consists of this: he does not know what he is saying. If, instead, we imagine God as fully as possible, we see that it is impossible that He should not exist. Therefore St. Anselm confronts folly with the doctrine of intimacy, the return to oneself, following the example of St. Augustine. When man enters within himself and finds himself, he also finds God, in whose image and likeness he is made. Thus, the ontological argument is an appeal to the sense of intimacy, to the depth of the personality, and is based concretely on the refutation of the fool.